On Wednesday, Maximus employees who work at call centers that handle Medicare and Federal ACA Marketplace inquiries attended the company's annual shareholder meeting in Reston, Va., to call on Maximus to respect their right to organize free from fear, intimidation, and interference. They also called on the company to meet with a committee of workers to discuss how improved working conditions would help achieve better outcomes for Maximus and its customers. 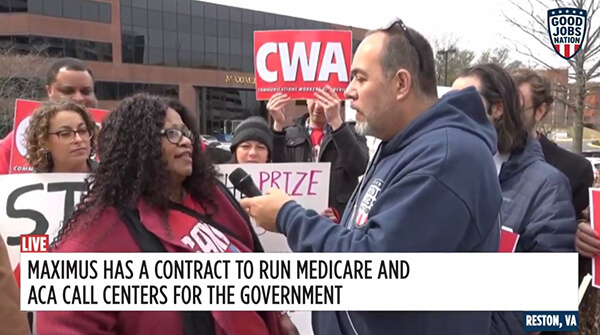 "Every day, we do the work to ensure Americans have access to the healthcare they need, but Maximus continues to pay us poverty wages," said Railonnie Brooks, a trainer at a Maximus call center in Hattiesburg, Miss., speaking at the shareholder meeting. CWA has filed complaints with the U.S. Department of Labor alleging systemic misclassification and wage theft at several Maximus call centers (formerly owned by GDIT), where it has been estimated that employees could be owed more than $100 million in back wages. Prior to attending the meeting, Maximus call center employees delivered petitions calling on Congress to be vigilant in holding companies like Maximus accountable for labor violations. Workers brought a letter to the shareholder meeting addressed to Maximus employees from Rep. Jan Schakowsky (D-Ill.) in response to the workers' petitions to Congress. Schakowsky affirmed Congress' commitment to ensuring fair treatment of federally contracted employees and to scrutinizing contractors. "Any instance in which workers are denied a fair day's pay for a fair day's work is unacceptable to me," Schakowsky said in her letter. "It's all the more disturbing when those doing work for the federal government are not treated properly. Our tax dollars should support good, family-supporting jobs...not subsidizing poverty wages."